It was exciting to arrive in Penang – the destination we hope we will call home for the better part of the next year. What made it even better was that the holiday was not over yet. 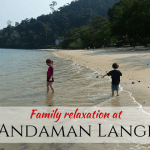 We had a few nights in the gorgeous Golden Sands Resort and Shangri La’s Rasa Sayang Resort and Spa before we had to get down to the business of starting our new life. 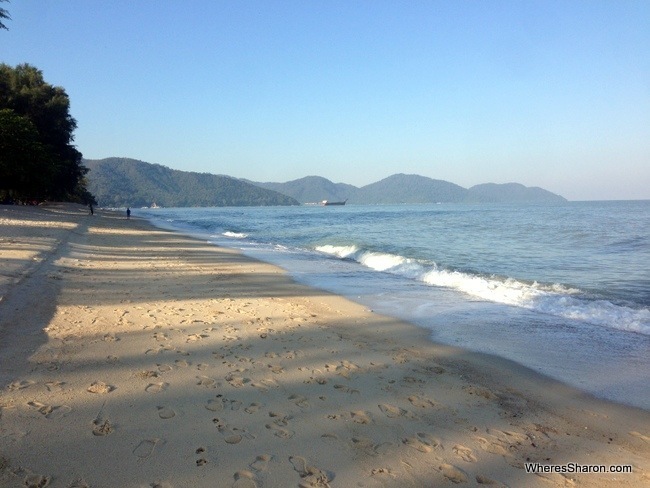 When arranging this part of the trip, I found our accommodation by googling what was the best family hotel in Penang. This resort kept popping up and for good reason. This resort is just perfect for families. In addition to the kids club and Adventure Zone (talked about more below), there are daily activities which are suitable for the whole family, some great pools and other facilities which make things very easy. 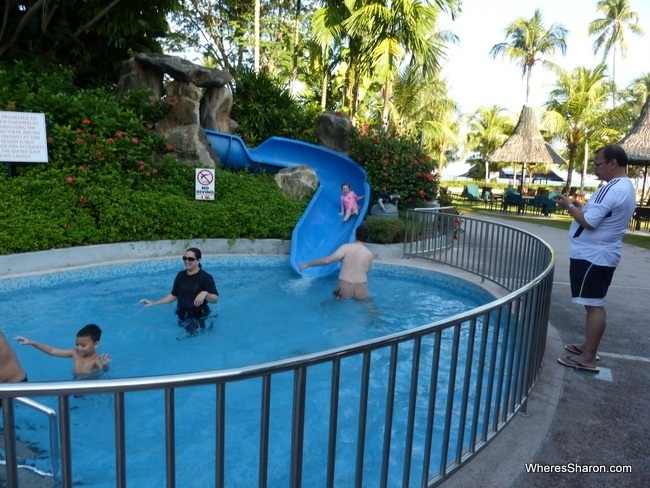 In fact, the Golden Sands Resort has won awards for being the one of the best family friendly hotels in Malaysia. Our room consisted on a king size bed and a pull down extra single bed – the kids loved how it came out of the wall! There is also an option for larger family rooms but this suited us fine. From the windows and the balcony, we had great views of the resort and out to the ocean – the photo at the top of this article was taken from the balcony. Looking out here was enough to get me excited and out and about when we arrived, despite the fact that I was tired from the travel to get to Penang. The room came with all the extras you would expect from Shangri-La. Lots of toiletries and extras, gowns and water that was replenished twice a day. 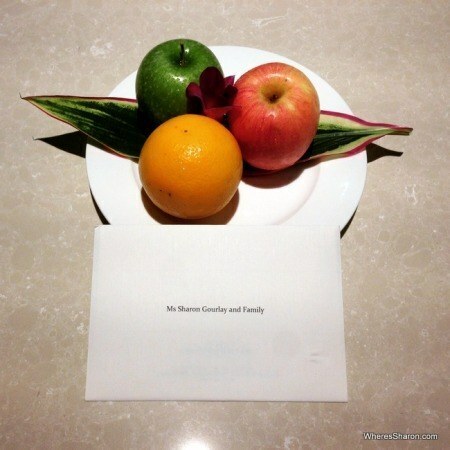 We had fruit and an arrival letter waiting in the room for us which was a nice touch. There was a turn down service in the evening which was great. At this time, they also tidied up a bit and gave us more water. Since travelling with kids, I so love an extra room service in the evening. There are a lot of facilities at this hotel. There are many shops, restaurants and lounges. Outside, there are two lagoon style pools, one great for children as well as an additional kids pool with water slide. The water slide was a gigantic hit and the kids spent the best part of a day on this. The outside area is so great that the morning we planned hanging out by the pools turned into an entire day. Tables and chairs are spotted throughout the grounds and raising a flag next to your table brings an attendant from one of the restaurants. It works well. You can also easily transition from the pool to the beach. For older kids and adults, outside you can also find pool and foosball tables, tennis courts and beach volleyball. There are also all the facilities mentioned below in the joint facilities. I was happy to find fabulous internet. We had a fabulous time at the Golden Sands Resort. It has an excellent family fun vibe. We enjoyed the facilities and were impressed by the staff who were always super friendly and courteous. We particularly were happy with the lifeguards who seemed to pay great attention and were excellent when S fell over and hurt herself. The included breakfast was great and went the extra mile of having great kids’ crockery which was a big hit. The kids also loved the resort’s mascot, Polly the bird, who came around and interacted with them. Click here for the latest prices for the Golden Sands Resort. 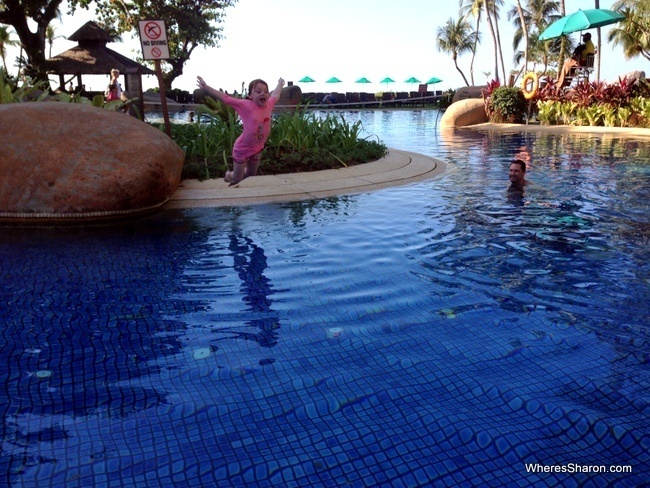 While Golden Sands Resort shouted family fun at us on arrival, the Rasa Sayang Resort shouted relaxation and luxury. This 5 star sister resort has many of the same features of the Golden Sands spread over more space with everything just a touch above in quality. The rooms are beautifully presented having all been refurbished in the Garden Wing last year. Our room featured a king size bed and a fold out sofa that was just perfect for both of our kids to share. The room was very spacious with plenty of space to add an extra bed if your kids need their own beds. Everything was lovely and new. On arrival in our room, we were presented with fruit and a special card. I love welcoming extras such as this. There was also a table and chairs and a big balcony with views over part of the resort and out to the ocean. Plenty of toiletries, gowns, thongs and other extras were included. The first thing I noticed about the Shangri-La is how big it is with plenty of space for everyone. It consists of two wings – the Rasa and the Garden. The Rasa is more suitable for adults and includes extras such as cocktail hour and afternoon tea. This area also has an adults only pool. The Garden Wing is more family focused with two pools including a kids one. The lagoon style made it very easy for both of our kids to enjoy this area. My favourite part of the grounds, however, would have to be the massive (and tranquil) landscaped gardens. They are sprinkled with lounge chairs and majestic rain trees with plenty of space for everyone. It was easy for our kids to run around without bothering anyone. There are also many restaurants, a deli and an interesting interactive lounge. There are many other facilities including a gym, spa, a yoga pavilion and a gift shop. There are also daily activities and tours, as well as a free bus to Georgetown. The Rasa Sayang is a beautiful resort. The extensive grounds and the peacefulness this place exudes while still being family friendly is quite a feat. I loved the attention to detail, the friendly staff and the absolutely awesome breakfast buffet. It may be the best I have ever seen. There were so many different cuisines on offer although the best part would have to be the corner dedicated to kids. I have not seen this before. We all loved our time at this resort. 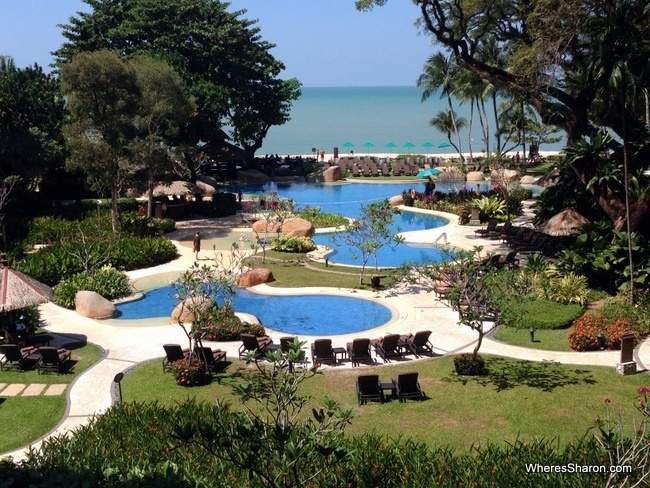 Similarly to the Golden Sands Resort, the Rasa Sayang makes it very easy to be as active or inactive as you like. In between the two resorts there are some joint facilities – namely Adventure Zone and the kids club, the Eco Centre, Pitch and Putt Golf Course, a beach soccer court and a spice and herb garden. The Adventure Zone was one of the best parts about our stay at these resorts and is one of the ways they stand out from other family friendly hotels. 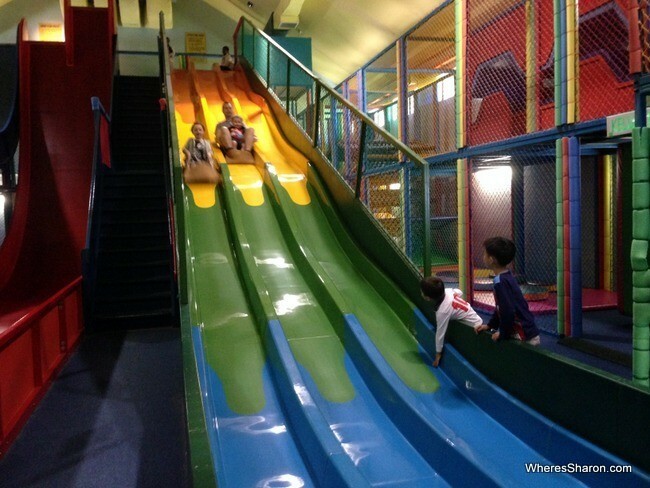 The Adventure Zone is an indoor play centre designed to comply with all UK and Malaysian safety regulations. It features the usual slides and play areas of a play centre including a toddler area. Its standout feature, however, are three massive drop slides. 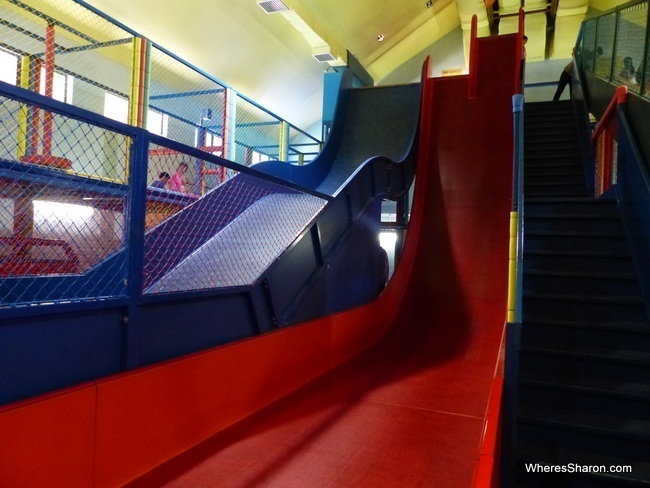 These slides have varying degrees in their thrill factor from a 15.2 metre, 5.5 metre high slide to one with a vertical drop of 7.3 metres. The least thrilling slide was thrilling enough for me and seemed to be incredibly fast. The kids just loved it and could have gone down it all day. The more thrilling slides would be perfect for older kids and teenagers. The other big slides – I dare you to do that drop! There is also an area for teenagers and adults with Nintendo Wiis, board games, pinball machines, air hockey, etc. Adventure Zone is where resort guests will find the kids club for 5-12 year olds. We had great fun here. To quote 2 year old Z, “this is brilliant!”. Of course, there is one attraction at both these resorts that I have not discussed yet – the beach! Both resorts are on a lovely stretch of beach. You can just relax or the kids can play with toys and games in a sand patch outside the Golden Sands Resort. There are also lots of water sports on offer. Parasailing seemed to be a popular choice. The kids loved staying at both these resorts and did not want to leave. Adventure Zone was big hit followed by the water slide and the pools. 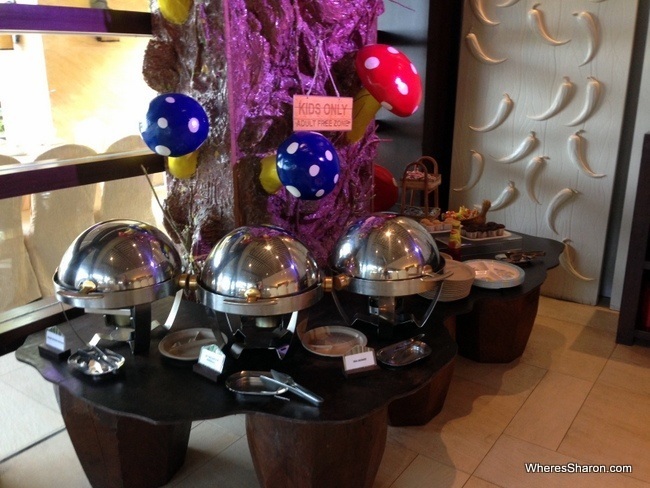 They also loved having a special breakfast buffet area at the Rasa Sayang Resort that was at their height. They loved the mascots at both resorts. The best part was that they were able to relax and be kids at both places without us stressing that they were being too loud or annoying others. These are both resorts that very obviously welcome families. We also enjoyed our stay here. 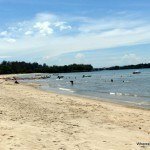 This is a great spot in Penang for being able to eat, hang out and enjoy the beach as well as being an easy commute to many attractions. Both resorts made our stay easy. If you are trying to decide which resort is right for your family, you really can not go wrong with either choice. 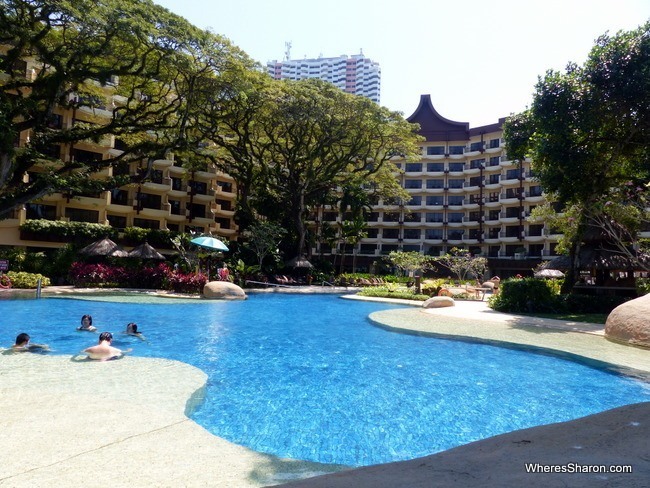 Both have access to great pools, the beach and Adventure Zone and kids club. The Golden Sands Resort is in a slightly better location being right next door to the night market. 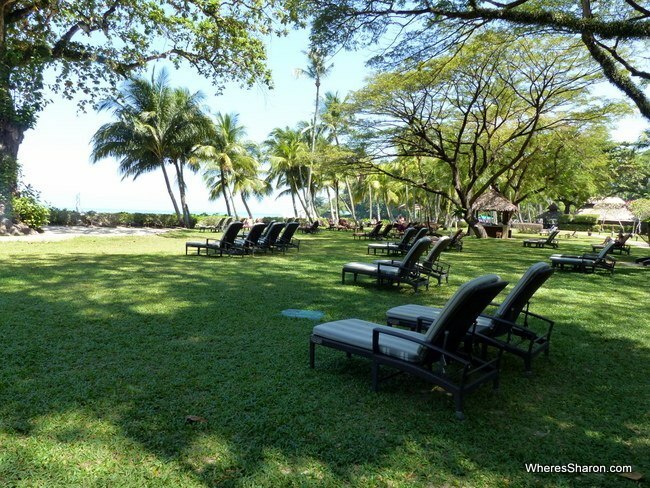 However, the Rasa Sayang Resort has more space and is more peaceful. It really depends what you are looking for and your budget. 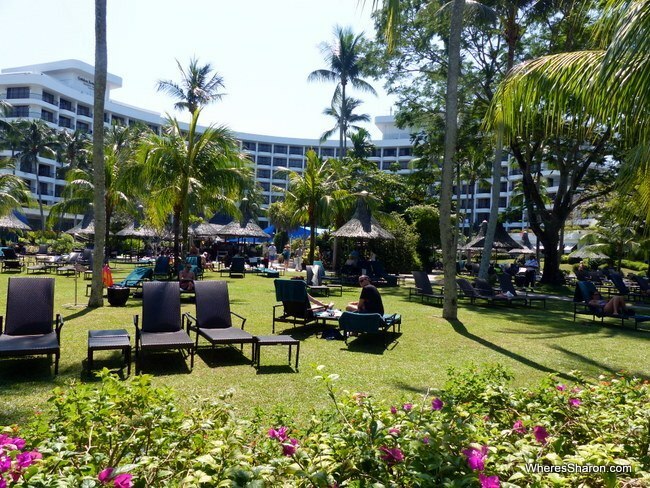 Click the following to find out more information on the Golden Sands Resort (see latest prices here) and the Rasa Sayang Resort (see latest prices here). You can also read our full guide to the best hotels in Penang. 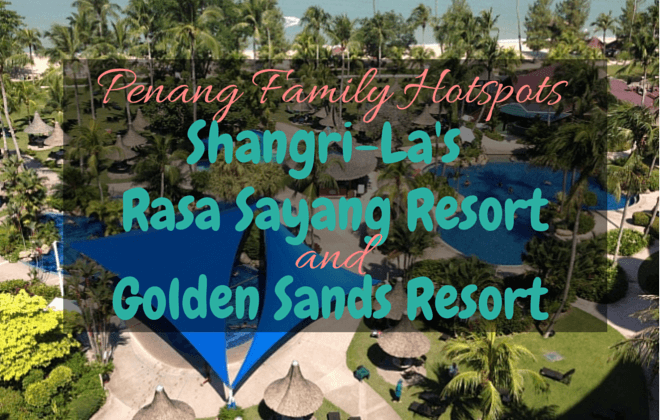 We were guests of the Golden Sands Resort and Shangri-La’s Rasa Sayang Resort. As always, my views are my own. Oh these both look great and just what we will need when we arrive in Penang next month. I am going to have to check them out. What a treat for you guys! If you ever get the chance to stay at an Outrigger resort I’m pretty sure they all have the kids buffets at dinnertime. The one on the Coral Coast in Fiji does so I’d presume they all do. Did you use the kids club for your older kid? How was it? Hi Jessica! No we did not. I have heard from others that used it that it was good though. 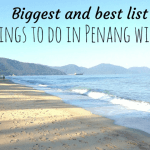 We have just booked flights to Penang and even after reading this blog post I still feel unsure as to what accomodation to book. Trying to decide between the two resorts. Kids will be just turned 3 and nearly 5. Budget doesn’t matter. Just did a crazy busy trip stopping in Singapore / Lego land etc and the U.K. Moving lots to see family. We are wanting something relaxing where we can get a Nanny at night once the kids are down so we can go out for dinner in the resort too. Could you recommend a Nanny / Nanny service or would you use the hotel services. Hi Tanya! Honestly, you can’t go wrong with either hotel. I prefer the Golden Sands with young kids (ours were nearly 3 and 4.5 when we went to both of these options 🙂 ) because it had more of a family vibe and just seemed more fun with kids. However, the Shangri La is a beautiful hotel and everything was a bit nicer and much more spacious. The Golden Sands is closer to lots of eating options which can also be good with little legs. It’s worth getting out to eat the food in the surrounds. It is crazy good in Penang. We lived right near these hotels as well, so you can see some restaurant recommendations here. We never used a nanny service in Penang so I can’t recommend any. I would just use the hotel babysitters. Great article. We are planning to visit Penang with 2 families travelling together. Kids of 3, 5 and 8 and 4 adults. Hi Susan! I just took a look at the sites to refresh my memory. 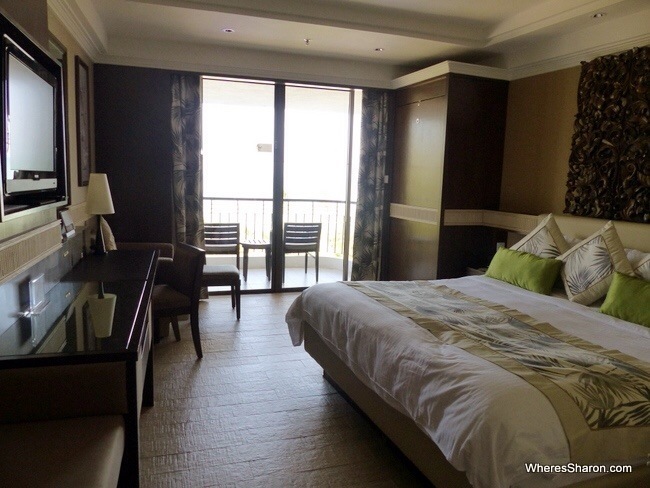 At the Golden Sands, we stayed in a deluxe sea facing room. Our two year old shared a bed with us. If you want a bed each for the kids, it looks like you may need to book two rooms. At the Rasa Sayang, I think it was a deluxe seaview and the sofa bed we had was big enough for two kids. They also seem to have rooms with two double beds and connecting ones. Thanks for the info, Did you ever visit the Hard rock hotel in Penang? How does that compare with Shangri-las? They seem to have family rooms with own space for kids beds. We used the outdoor area (which is lovely) but I have not seen the rooms or stayed there. Thw downside with the Hard Rock is that it is a little bit removed from the main part of Batu Ferringhi. 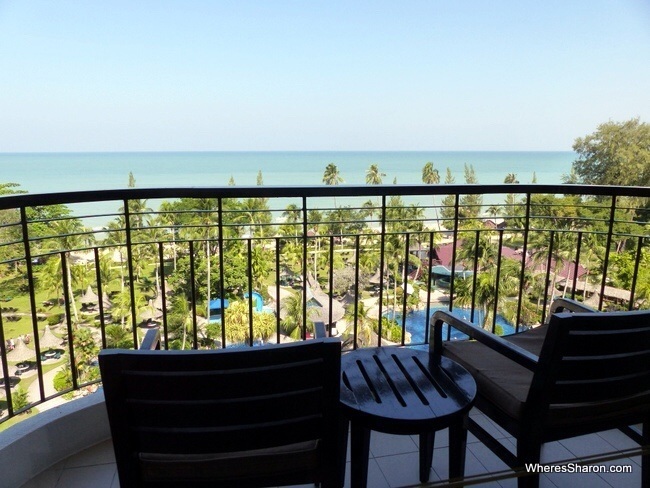 We also stayed at Holiday Inn Resort and Bayview. I wrote a little bit about them here.